The Hand are going to need to bring a few more troops next time. Killing is just about the only thing that comes easy for Logan. When a locust of Hand ninjas descend upon him, Logan knows precisely how to get the job done. Love, however, is a challenge for the X-Man. “Wolverine” has aged well since it was first published as a four-issue limited-series in 1982. The story is simple and significantly less fantastic than the exploits that were taking place in “The Uncanny X-Men” at the time. “Wolverine” is the story of a man who has been inexplicably jilted by the woman he loves and who feels that he deserves some answers. What is remarkable about the book, for someone who hasn’t revisited the story for decades, is that the character is considerably more grounded than he’s portrayed in contemporary stories. That isn’t a criticism about how writers handle the hero today, but there’s a sense of vulnerability here, as well as a genuine concern for Logan’s survival because he isn’t rendered as an indestructible being. Logan is also more imperfect than his present-day counterpart. Sure, he’s grown a great deal wiser in the last 30 years, but it makes for a satisfying read to follow this character who, in this story, hasn’t achieved his prime. Frank Milller handles the art on “Wolverine” from a script by longtime “X-Men” writer Chris Claremont. Miller was still evolving into a style that would be more recognizable to fans of books like “The Dark Knight Returns” and “Sin City”. Miller’s work in “Wolverine” still retains signature elements of the artist, such as the sparseness between his panels, with a rawness that compliments where Claremont takes the character. A highlight of the artist’s work is the inclusion of all four covers of the mini-series, each representative of who Logan is: a combatant who always welcomes a brawl, a warrior whose ferocity sometimes consumes him, an innate hunter, and a man seemingly destined to remain alone. “Wolverine” is more a story of Logan, the man, than it is of Wolverine, the hero. Claremont and Miller open the book with Logan tracking down a crazed bear that has slaughtered more than a dozen people as a result of a poisoned arrow, thoughtlessly left in the animal by a hunter. Being a more personal story, Claremont and Miller choose to have Logan out of costume, or at least without his mask, for a majority of the story. It’s a smart choice because the “Wolverine” is a personal journey for Logan; it’s important that we are able to observe his reactions, such as when Logan learns that Mariko has returned to Japan to marry another man. She’s been forced to do so to honor a debt of her crime-boss father, Lord Shingen Harada. In the opening chapter, Wolverine travels to Japan where he finds Mariko badly beaten by her new husband. Before he can leave, he is dazed by poisoned shuriken that were meant to kill him. When he awakens he is forced into a sword fight with Shingen. Logan struggles with the poisoning as he narrowly holds his own against Mariko’s father. The action in “Wolverine” was made more compelling because the hero wasn’t an invincible force, but instead a man with extraordinary gifts who strained himself from scuffle to scuffle. Claremont steps back for most of the scene to let Miller show off his capacity as an artist of engaging, well-choreographed brawls. Colorist Glynis Wein enlivens Miller’s pencils, especially when Logan finds himself tossed on the streets of Tokyo with lighted signs radiating the city. Claremont doesn’t expound on why Logan is in love with Mariko, but Miller magnificently captures her beauty. 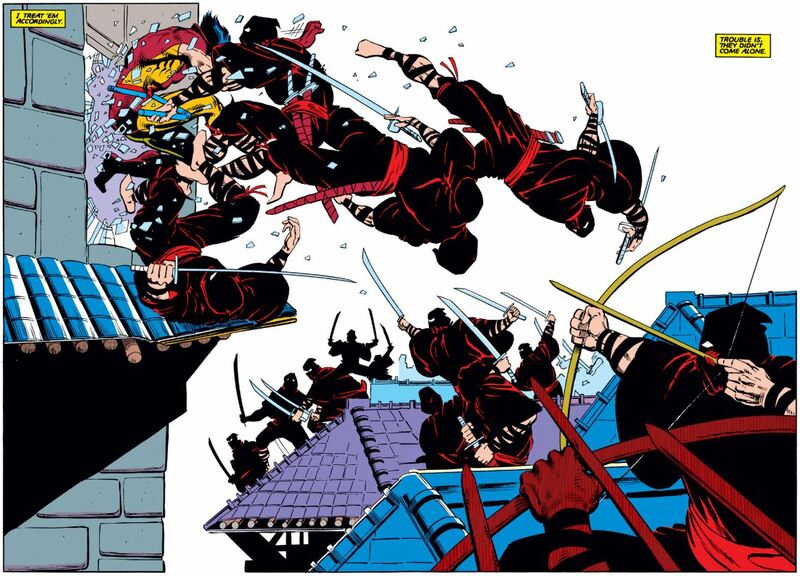 Logan dives from one scrape to the next as he meets a female warrior named Yukio about five seconds before being attacked by the Hand, a nasty group of ninjas brandishing what appears to be every arrow in Tokyo (and possibly beyond). Again, Miller is a master of battle sequences; here Logan pushes off a group of Hand combatants as a larger group heads towards him with arrows and swords. Yukio takes no time to throw herself at her new ally, but Logan’s heart still belongs to Mariko and denies Yukio’s advances. While attempting to protect Mariko, Logan slaughters a group of samurais while in one of his famed “berserker” rages. Mariko’s expression, drawn brilliantly by Miller, tells Logan everything he needs to know. She is horrified by what she’s witnessed and she turns her back on her former love. Wolverine accepts that Mariko is out of his life and goes to work taking down Shingen’s criminal enterprises piece by piece. This builds to a final battle between the two men. However, this time Wolverine is not drugged. Claremont offers almost no narration as the adversaries meet in a battle from which only one of them will walk away. Miller composes a battle where both men are equally matched, neither are about to go down without getting some good licks in. Claremont had years to define Logan in “Uncanny X-Men”, but it’s in “Wolverine” where some true exploration takes place and we are exposed to a more developed soul. Logan is a hero, as evidenced by his battle with the murderous bear and the confrontation with the hunter responsible for the animal’s condition. Logan is a soldier, always prepared to head into battle to save his hide and the hides of any innocent in his vicinity. Most importantly though, Claremont and Miller illustrate that Wolverine is a man. He is consumed with a love that he will not casually dismiss, even when there does not appear to be any way that his romance with Mariko will work out. Logan is presented as fallible and not as an unstoppable fighting machine. The singular problem with “Wolverine” is that we never understand what it is about Mariko that has Logan so smitten with her. She gets little to do in the mini-series so, as readers, we have to believe Logan is in love with Mariko because he keeps saying so. Since this book was published in 1982, Wolverine offers exposition of his powers in each chapter of the story. It would have only strengthened the material if Claremont had provided similar clarification as to why his hero’s heart yearns so strongly for Mariko. This volume contains a follow-up story from “Uncanny X-Men” #172 and #173 in which Logan’s teammates come to Japan to visit their friend in his home away from home. The story, by Claremont and artist Paul Smith, veers back into the fantastic as the Silver Samurai and Viper come to town to complicate Logan’s peaceful existence. The story is fun, featuring a classic roster of mutants, and the pencils by Smith are as extraordinary today as they were back in 1983. “Wolverine” is a modest tale that properly introduces readers to the man named Logan. We begin the story knowing he’s the best he is at what he does, but we leave with a clearer understanding that not everything else in his life comes so easily. comiXology.com Only includes 1 through 4 of “Wolverine”.